Myung "Mario" Jung was born September 14, 1949 in Seoul, Korea. Mario has an outstanding national and international reputation as an artist. Mario has a dramatic brush stroke that is unparalleled. His style and coloration are unique and distinguish his paintings from all others. 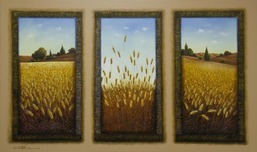 The rhythmic formation of Mario's paintings show high artistic talent and separates him from other talented artists. Graduating from the Seoul Industrial Junior College in 1971, Mario longed for his artistic talents to take flight and in 1986 he entered the Exhibition of Fine Art of the Seoul Artists Association, where he was awarded the Grand Prize of Western style painting. Due to this immediate success, Mario was invited to become a member of the Seoul Artists Association, of which he has now been a member for over 30 years. His life changed dramatically when he was paralyzed, blinded, and deafened as side effects frm a catastrophic third-story balcony fall. Not even interested in food, Mario was giving up until he had a spiritual dream that renewed his strength and his will to live. Leaving doctors, family, and friends amazed and perplexed, Mario recovered completely and has since meticulously developed his flexible artistic style. 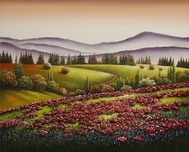 His multifaceted talents allow him to create richly colored landscapes, brimming with texture and warmth. 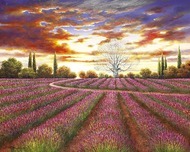 Brushstrokes announced by fields of color and thick paint bring viewers to the setting sun across the spanning poppies of nestle them safely under a shaded tree. In contrast, his photo-realistic paintings create subtlety and sensuality as two lilies intertwine or pears reflect across a stark blank canvas. 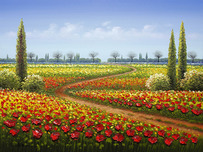 Truly a talented artist, Mario's popularity is heightened by his ability to create such a diverse range of work. Remember every time you purchase Mario artwork over $995, shipping is FREE in the continental U.S. and there is NO SALES TAX when you purchase outside of Colorado. We SHIP WORLDWIDE and offer Layaway for Mario art.